Kayak and Canoe | WANDERUNG! “Am I really going to do an 8 day kayaking trip with total strangers?” The cursor hovered hesitantly on the ‘send’ button on the Wanderung callout email I had just written. “What’s the worst that can happen?” I thought, and with one click of a finger I eradicated my indecision and sent it hurtling out into cyberspace. Day 1: Captain’s Log Star Date: May 28. Travel from Toquart Bay to Hand Island. We are standing at the launch site in Toquart Bay. John is determined to pack what seemed like half a grocery store into his kayak and is using his entire body weight to get his rear hatch cover to close over his frying pan. Dennis, the other paddling partner is compact and has extra space which John happily fills. Confident that we won’t starve, we launch on a bluebird day and head for Hand Island not more than a few hours away. We land on a sandy west-facing beach and bask in the evening sun. There are purple flowers that line the entire pathway to the solar composting toilet, and if you keep going the path takes you to another secret beach on the other side. Dennis catches a rock crab and John cooks it over a fire while we marvel at being able to see the stars. We fall asleep to the sound of the tide creeping closer and the magic of these islands begins to permeate into a place in ourselves that we hadn’t accessed in a long time. Day 2: Hand Island to Turret Island (stop to see giant tree) then paddle to Clarke Island. As he approaches shore on Clarke Island, John vaults his paddle like a javelin onto the sand and jumps out of his kayak like the snake in a can of nuts that has just been opened. I sigh and stare at my $400 Werner paddle and vow never to let John touch it. Before his boat is even pulled up and life jacket is off, John is fiddling with the bungees on his boat to free his fishing gear. “Let’s get these crab traps out!” he yells excitedly as his paddle begins to float away with the tide. I think about this between mouthfuls of fresh crab. Even if I was barefoot and pregnant in a time when the First Nations roamed this island, I had to admit I would have still been impressed with their manly abilities to harvest what the ocean had to provide. Day 3: Paddle around and hiking on Benson Island. I have ambitious plans of a long day of paddling around the exposed outer islands. When I tell this to the boys they stare at me with the eyes that a six year old would give you if you had just asked him to turn the Saturday morning cartoons off to go outside and play. “But we’re tired and we want to go fishing”. We strike a compromise. Benson Island was close by, we could paddle around it and then land and do a hike to the ‘blowhole’ which was a hole in the rocks that sprayed water up like a fountain when the waves crashed into it. This pleases them and John plops his fishing hook in the water to troll for salmon on the way over. Benson Island was originally open to camping in, but has been recently restricted to day visits only due to archeological surveying that is currently taking place. 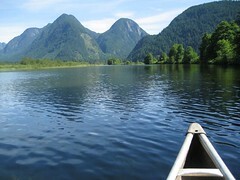 The Tseshaht First Nations in the area believe that Benson was the place where their version of the Adam and Eve story took place for their people. Anyone landing on Benson can see why. With rugged shorelines, beautiful sandy beaches and lush old growth rain forest, if life was going to start anywhere, it would make sense that it would be on this paradise island. Did you catch anything? “No,” says John dejectedly before pulling up his line with some difficulty before realizing that he had caught a fish and just had been unwittingly dragging it around the entire paddle. His eyes light up like Christmas, “A fish! I caught a fish!” We take it to shore and John pummels it with a frying pan, a most fitting object of death for a tasty fish. Just before we land back on Clarke we notice blows from a whale. We watch mesmerized by this underwater leviathan gently rolling to the surface to breath. Scanning the surface for krill with it’s impressive baleen, it swims further away until its blows disappear into the setting sun. Day 4: Paddle around Wower Island to Dicebox Island around the backside of Effingham, round Gilbert and back to Clarke. 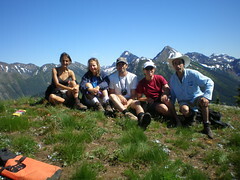 Clarke Island, we were told by the fee collectors, is the best campsite in the Broken Group. We believe them immediately. There was a large sandy beach, the kind your feet loved sinking into, and directly behind was a grassy field that was consistently being mowed by fearless deer who would let you get so close you could almost touch them. In the morning Dennis and I leave John to bask in the morning sun and we set off to explore the outer islands. As we approached the outside of Wower the waves became more hectic and confused and we bob around on the increasingly larger swell like rubber ducks in a tub filled with rambunctious children. We take shelter between Wower and Bately and watch a group of 30 sea lions on a rocky outcropping try to out-bark each other in a cacophony of sound. We have lunch on Dicebox Island and try to image what it would have been like to land there 500 years ago and know no other life than this. In these heavily windblown, salty isolated islands life still abounds in lush green canopies and in the boundaries between the tide and far deeper than we can ever see and travel. Paddling around the exposed east side of Effingham Island we can see what the ravages of wind and waves have done to the spectacular rocky shore. Sea caves and sea arches line the shoreline and we resist the urge to paddle inside as these are sacred burial sites for the Tseshaht people. Small droplets of rain began plunking and making rings all around us with increasing intensity. The surface of the water started to resonate and shake as if there was an angry neighbour below us banging on his ceiling and yelling at us to stop making all that racket. We unwittingly obey as we silently and soggily paddled back to Clarke. Day 5: Paddle from Clark to Gibraltar. Little islets and rocks jut up from the surface like flowers that manage to break through cement sidewalks. I try to imagine the tectonic plates underneath us causing the whole bottom of the ocean to fold and bend like peanut brittle. The pressure and friction release exploding underwater volcanoes and whole mountain ranges appear with their apexes peeking out above the surface of the water allowing us to camp on a zenith at sea level. The site on Gibraltar is gorgeous and even though the beach is gravelly, we are glad to not be in the sand any more. The boys went fishing and I got to the task of setting up a large camp tarp when I noticed an eagle fly closer than I’ve ever seen. Dennis comes back and begins searching for a filleted fish he left on a log. After an extended search we noticed the eagle perched smugly in a tree that towered over our campsite. The mystery of the missing fish was solved: Eagle 1… Dennis 0. Dennis stops abruptly. “Wait a minute… are we seriously debating over whether we would rather eat dirt or sand?” I think that’s how you know when it’s day 6 of a trip. Earlier that morning we paddle to the Jacques Jarvis lagoon to catch a 1 foot low tide. Diverse colours of bat stars line the bottom of the lagoon and many tiny fish dart in an out of the eel grass. John and Dennis try to catch scurrying crabs on the sandy bottom with their paddles. We paddle into a natural fish trap and the entire channel is packed with huge red California Stickapus sea cucumbers. Measuring about a foot long, slimy and with a diameter a bit larger than an actual cucumber, these creatures have soft spikes and look like something they would make you eat on the show Fear Factor. On the way back the sky opens up with rain and chills me to the bone. Feeling monstrously ill upon my return back to camp I fall asleep in my tent to wake up in the evening to the boys tending to a fire. “The crab curry is ready and we pre-cracked all the claws for you because we know they are your favourite.” Afterwards they cleaned up the dishes and packed away the food while I sat by the fire. I was mercifully grateful that I wasn’t alone on this trip. Day 7: We leave the gravelly beach of Gibraltar and head to the north side of Nettle Island, cross Coaster channel, through the Pinkerton islands and back to Hand Island. I am packing up some food and tarps, Dennis is tearing down our tent and John is lying on a log in the sun wishing he was dead. That’s the funny thing about alcohol, it’s like an exhilarating roller coaster that always makes you throw up in the end. And no matter how many times it ends badly, you always line up for more. The passages between the Pinkerton Islands take John’s mind off his unsettled stomach. They are sandy and shallow which gives the water a beautiful tropical look and we feel as though we are floating over a glowing green road to the Emerald City. If we could speak to the Wizard of Oz at that moment, I would wish for a new bladder as I had to pee, Dennis would ask for a new stomach since he was hungry, and John would probably ask for a new brain that wasn’t throbbing. We settled for lunch on a mud flat and then paddled back to Hand Island and John cast out the crab traps for the last time on our trip. I fall asleep that evening feeling sad that tomorrow would be our last day, but exhilarated at the prospect of soon being able to shower. Day 8: Hand Island to Toquart Bay. Hand Island gets smaller as we paddle away from it. I take a picture but it comes out looking like a small blob on my camera screen. Pictures never capture the true beauty of what you’re seeing and I try to burn it into my memory. The day is so hot the tops of my hands start to burn and when we arrive to Toquart Bay we don our wetsuits and take our kayaks for a swim and do some rescue practice. Finally after packing up our boats we walk smelly and salt incrusted into a pub in Port Alberni and watch the Canucks win game 2 of the final series. After a well earned beer, a lingering goodbye we part ways so I can start writing this rather lengthy trip report and prepare for our next trip. 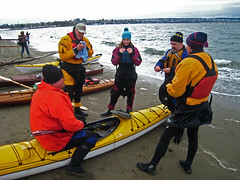 “This was my second annual call-out to kayak to English Bay to partake in the festivities of the Vancouver Polar Bear Swim. Bart from kayrak.ca (check it out! ), the only other Wanderung member that ended up coming, made a last minute decision to register and go for a swim! “Our group of 8 headed out for a great 6-days on the water around both the Johnstone Strait south of Telegraph Cove and north through the Broughton Archipelago (as far north as Insect Island and Echo Bay). We got a little of everything… Half the time there was beautiful sunshine but we also had a day of rain. The winds picked up for sections of our days (including one “exciting” crossing with waves from both current/wind, and also from the wake of a cruise ship!) but we also had wonderfully calm days. Campsites ranged from amazing island set ups with wooden structure outlines ready for tarps & tree swings to simple clearings in the woods. We had lazy easy days and a couple long paddle days. Highlights from the trip included seeing porpoises everyday, orcas half the days, visiting First Nation reserves/abandoned communities, campfires every night, amazing food, freezing dips in the ocean (did I mention the WARM campfires?!?! 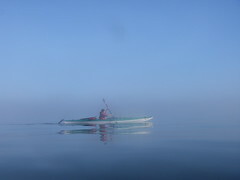 ), navigation practice during early morning fogged-in paddles & hunting down camping areas amongst the islands and the distance we got from the crowds of Johnstone Strait. Good times on and off the water!